Top 10 Best Water Softeners (April 2019) - Reviews & Guides! Almost 85% of water supplies in the United States, and varying proportions in other countries, are understood to produce ‘hard water’, that is, water which contains levels of calcium and magnesium minerals that cause lime-scale deposits in water pipes, fittings and appliances, especially when the water is heated. In addition to this, soaps, shampoos and some detergents do not perform well in hard water, producing less lather and sometimes a ‘soap-scum’ which inhibits cleaning properties. This can lead to increased costs in terms of power for heating water such as in kettles and instant water heaters owing to the insulating effects of scale buildup on the heating element, more frequent replacement of appliances due to failures related to over-heating of elements, and the need for regular cleaning or replacement of blocked fittings such as shower heads. And of course there is also the cost of additional washing agents needed to produce the required level of cleaning. In order to combat lime-scale build-up and to improve cleaning efficiency, it is necessary to ‘soften’ or ‘condition’ the water as it enters your home. Water conditioning refers to other technologies that do not remove or replace the calcium and magnesium ions in the water, but ‘condition’ them so that they do not form lime-scale, but either remain suspended in the water or form a less resilient type of scale when the water evaporates – such as on shower doors or kitchen counters - that can be easily wiped away. If you’re looking for an all-in-one whole house filter that removes sediment, odors and scale in areas supplied by hard city water or low sediment well water, the 3M Aquapure AP904 Whole House Water Filtration and Softener System will improve water quality and taste while helping to protect your home’s hot water heaters, water-using appliances and plumbing fixtures from scale build-up. Made by world-renowned company 3M, it comes with a 25-year limited warranty on the stainless steel head and a one-year limited warranty on the AP917HD-S filter cartridge. It has a Sanitary Quick Change (SQC) feature that allows you to change the filter cartridge easily and with almost no spillage or mess, by simply twisting the cartridge out and replacing it with a new one. No need for a wrench or a screw-driver, and the filter housing features a secure, waterproof seal. 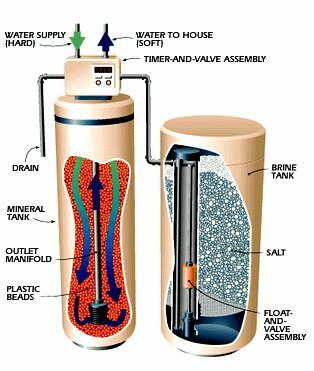 Instead of need the regular addition of salt for water softening, the AP917HD-S water filter cartridge incorporates scale inhibiting polyphosphates in minute quantities to bind calcium and magnesium hardness minerals, preventing them from precipitating out and building scale on metallic surfaces. In addition to scale inhibition media, the AP917HD-S water filter cartridge uses carbon block filtration and non-woven pleat media to exclude sediment down to 5 microns while also reducing chlorine taste and odor. The filter cartridge should be replaced as soon as there is a noticeable drop in household water pressure. This may be only once a year, depending on the quality of the input water, but if the replacement intervals are shorter than expected, the lifespan of the filter can be extended by installing a 5 micron sediment or spin-down filter in line ahead of the 3M Aquapure system. No electrical power is needed to operate the AP904 whole house water filtration system. With a flow rate of 10GPM (37.85 liters/minute) and a rated treatment volume of 100,000 gallons (378,500 liters), the 3M AP904 whole house water filtration system delivers enough safe, crystal clear, soft water for a home containing up to two and a half bathrooms. The materials used in the system are FDA CFR-21 compliant and are safe for drinking water and food. Given the good quality of water produced, the sturdy build of the system, the simplicity of installation and the low maintenance aspect of the system, as well as the ease with which filter cartridges can be replaced, the 3M Aquapure AP904 Whole House Water Filtration and Softener System is a great option for those who would prefer to avoid sodium-based water softeners. Standard salt based ion-exchange water softeners replace the calcium that causes water hardness with sodium to reduce lime-scale and promote lathering, so if you’re on a low sodium diet, you may want to avoid a water softener that uses salt or potassium. Or you may just be tired of having to lug bags of salt around every time you need to replenish your water softener? There are a number of alternatives, but for an absolute no-maintenance option, the Eddy Electronic Water Descaler is a great choice. The Eddy Electronic Water Descaler does not replace health-giving calcium with sodium, as with salt-based ion-exchange water softeners, so your water will still be full of healthy compounds, they just won’t be such a nuisance to the pipes and appliances in your home. The Eddy Electronic Water Descaler uses only 5 Watts of energy and reduces lime-scale buildup by 42%, with the remaining scale becoming soft and easy to remove. It has been reported to also improve lathering to remove existing scale. It is easy to fit, doesn’t require any plumbing or alterations and once it’s in place, you can forget about it. Installation is as easy as winding two cables around your household water inlet pipe, connecting them to the control unit, plugging in the power and switching it on. How easy is that! If you’re not satisfied with the performance of your Eddy Electronic Water Descaler, you can return it within 12 months of date of purchase and you will receive a full refund, although Eddy states that they have had a very small percentage of returns as most customers find it beneficial. Suitable for people on a low sodium diet and/or people that don’t want to use a water softener that uses salt or potassium. The avid RV enthusiast will know from experience that many sites supply water that is hard, difficult to wash with, and can lead to scale in your RV’s pipes, tanks and water heater, as well as in the kettle. Rather than going to the expense and hassle of having a water softener system built into your RV, consider the benefits of the RV-PRO (Watts M7002) 10,000 Portable Water Softener. The RV-PRO 10,000 can handle a flow rate of up to 4 GPM (15.1l/min), although the flow rate at any faucet in an RV usually about 1 gallon per minute (3.79l/min). The RV-PRO 10,000 Portable Water Softener is 20.5” high and 8.5” in diameter and it weighs 26lbs when loaded with resin. The full cradle base on the tank keeps the system sturdy and secure when you need to work on it, and it won’t fall over unnecessarily and cause breakages. The tough, lightweight fiberglass tank body will stand up to years of use in the outdoor environment. The water softener comes supplied with 1/3 cu. ft. (9.43dm³) superior quality gold resin with a high 10,000 grain capacity, and can last over 10 years, dependent on water hardness and volumes treated. The resin is pre-treated so there is no need to add salt to the system before its first use. Its custom designed output valve allows the output line to be isolated from the drain line, so that it is not necessary to disconnect the system during regeneration. It is light and easy to use and can be placed inside or outside your RV. It uses just 2 lbs (0.9kg) of ordinary table salt for regeneration, so it only costs pennies per gallon to operate. Its built-in drain line flow restrictor increase its regeneration efficiency and it is very simple to use. The system is compact and portable. The valve design promotes efficient regeneration. It uses ordinary table salt for regeneration so is very economical to operate. The stationary inlet hose connector is difficult to attach a feed hose to. The y-valve is made of plastic and can break if not used correctly (never lift the system by the valve). Watts RV PRO-1000 Portable Water Softene is the ideal companion for the RV enthusiasts that likes to explore out of the way places, as well as the regular camper who frequents sites that have hard water. Most users have been very satisfied with the performance of the RV-PRO (Watts M7002) 10,000 Portable Water Softener, once they have got used to the operation of the system. As they said after they have purchased it, they wish they had got it earlier! The On The Go OTG4-DBLSOFT Portable 16,000 Grain RV Water Softener is an essential appliance for RV enthusiasts and boat owners who are likely to hook up to water supplies that contain hard water. It is designed by RV enthusiasts for use by RV’ers and boat-owners, taking into account all the challenges they face. The unit uses standard table salt for regeneration, is light and compact, has a carry handle on top of its swivel head for ease of movement and connection, and has a large opening for pouring in the salt. It includes storage inlet/outlet caps, back-flush adapter, hardness test strips, a 4’ (1.2m) white drinking hose, as well as a full cradle base for stability. This unit can provide up to 40 days of softened water, or 500 to 1,600 gallons (1.9kl to 6.0kl), before needing regeneration, depending on water hardness and volumes used. The large mouth on the top of the unit allows you to easily refill with salt without spillage or waste. Each On The Go® Portable Water Softener is covered by a limited warranty of one-year from date of purchase on materials and workmanship, as well as a 30-day customer return and refund (excluding transport costs) policy. The lightweight, stable unit is easy to set up and store away, making it indispensable to any RV or boat owner who values their investment. By protecting your RV’s water system for pennies per day, the ‘On The Go’ OTG4-DBLSOFT Portable 16,000 Grain RV Water Softener will improve the resale value of your RV when you decide to sell it or trade it in. The Fleck 5600SXT 48,000 Grain Water Softener Digital SXT Metered Whole House System is a whole house ion exchange water softener system with a digital controller and readout that makes it easy to monitor the state of your household water. The digital monitoring system on the Fleck 5600SXT measures water volume rather than time elapsed, making it much more efficient than mechanical softener control systems, and it has less moving parts so less potential for breakage. The regeneration cycle can be programmed to occur at time that is most convenient for your household and it provides a double-backwash (one slow and one rapid backwash) to improve the efficiency of the process. It has a programmable digital control system with a built-in memory that will last over 48 hours during a power cut, and retains your settings as well as a record of the amount of water softening still available. No need to reset everything when power is restored - it’s all still there for your convenience. The brine tank has a safety float that prevents over-filling, as well as an overflow outlet that can be linked to the backwash drain, so there won’t be any mess to clean up. Its large volume also means that you need to add salt much less frequently; it uses about one 50lb bag of salt per month for a 4-person household, depending on the hardness of the water. The ion-exchange system uses high quality resin balls that last up to seven years, there is a five year warranty on the control valve, and the tank has a 10-year warranty, so you can enjoy peace of mind with your Fleck 5600SXT 48,000 Grain Water Softener for years to come. If you have a problem with hard water and want a convenient, easy to use and reliable water softener, the Fleck 5600SXT is what you are looking for. Although treated city water generally contains low levels of iron and manganese, most well-water sources contain higher levels of iron that can cause red/brown stains in plumbing fixtures such as toilet bowls, and staining of laundry. The Iron Pro 2 Combination System is one of the most effective systems for dealing with hard water that also contains medium levels of iron. The reliable Fleck 5600SXT digitally controlled valve works on a turbine-electronic flow meter instead of a timer or manual flow meter, giving you a more accurate measure of the amount of water treated by the system, making for a more efficient rate of regeneration. With just a single moving part, there is less to go wrong, and the digital control allows the timing of the regeneration cycle to be set so that it takes place at a convenient time when no-one in the house is using water, so no untreated water flows through the bypass valve and into your household pipes. The built-in memory facility means that the digital control settings are retained for over 48 hours even if the power supply is accidentally unplugged or there is a power cut, so you will know how much water treatment capacity remains when power is restored, and you won’t need to redo the settings. The Iron Pro 2 Combination Water Softener and Iron Filter is a whole house system that will improve the quality of your household water without the need for a multitude of systems. It removes up to 64,000 grains of impurities (calcium, magnesium, iron and manganese) from your water supply to leave you with soft, non-staining household water for improved all-round washing performance. Double backwash for more efficient regeneration. The combined water softener and iron filter system requires a relatively large financial layout (but is not as expensive as two separate systems). The Aquasana 1,000,000 Gallon Whole House Water Filter with Salt-Free Softener, also known as the ‘Pro Rhino + Softener’ system, or the EQ-1000 with SimplySoft, is a combined point of entry water conditioning and filter system with a massive one million gallon treatment capacity. The Aquasana Salt-free Softener system uses proven Nucleation Assisted Crystallization (NAC / TAC) water conditioning in place of a salt-based softener to reduce lime-scale formation and has a .35 micron post-filter to further reduce any remaining sediment and organic particles in your household water. It requires no salt or regeneration so there is no need to carry heavy salt bags or pour the salt into a brine tank every few days, and you won’t be adding sodium to your household water or discharging salty water into the environment. It also doesn’t use electricity so there’s no need to have an electrical socket located nearby, and the system won’t demineralize your water while it protects your home’s plumbing, fittings and appliances from scale build-up. The Aquasana System has a 10-year limited Warranty on defects in material and workmanship, as well as a 90-day from date of receipt ‘pure satisfaction’ money-back guarantee. The main filters have a capacity of 1,000,000 gallons (3,785kl) at a miximum of 25gpg, with an estimated service lifespan of 8 to 10 years for a 4-person family. The 20” 5-micron pre-filter has an expected lifespan of 2 to 3 months. It is designed for homes up to 3,500 sq. ft. (325m²) in size with 3½ bathrooms or less, and is intended for use with city water where the filter is able to remove up to 97% of chlorine in the water supply. A UV filter can be added after the system as an optional extra, but this is usually only required for rural well water supplies. For large family homes using well water, the WaterBoss Water Softener Model 900 is a great option. It is an attractive programmable water softener with a 36,400 grain capacity that can soften up to 90 grains per gallon while reducing up to 10 parts per million (ppm) of ferrous iron and sediment. The all-in-one water softener has an enclosed design and integrated controls are all packaged in a stylish compact casing that would not look out of place anywhere in your home. In its default high efficiency mode it uses up to 80% less water and 50% less salt than other home water softener, and it also features a built-in, whole-house, self-cleaning dirt and sediment filter. It has a programmable digital control panel with four buttons and an LCD display that allows you to set and monitor the status of the softener at the press of a button. The WaterBoss 900 Water Filter is best suited for well water, but for city water with high chlorine content, you should look at the 950 model. As a salt-free water conditioner with a built-in sediment and chlorine filter, the Aquios FS-220 system is hard to beat. It’s a whole house all-in-one water conditioner and sediment filter with a slim profile and Valve-In-Head design that make it easy to install in small spaces, while it allows filter cartridge replacement without any mess and spillage. This technology used is a natural, FDA-approved, food-grade polyphosphate additive known as Siliphos that acts to inhibit the formation of scale deposits and will, over time, reduce the build-up of lime-scale deposits in your water pipes, appliances and water heaters. It will also result in your water feeling better but not ‘slippery’ as with salt water softeners. ​The AQUIOS Water Treatment System includes your first high absorption RCFS220 filter cartridge which has a 5 micron filter rating with effective water hardness reduction of 22 grains per gallon (380ppm) and chlorine reduction of 12,000ppm at 2 GPM. The cartridge is rated for treatment of up to 40,000 gallons of water but its period of service depends on the hardness of the water being processed. It should, however, be replaced at least every 6 months. The system’s design requires no programming or electricity, ensures virtually no reduction in water pressure or flow rate. The system is designed for homes ranging to 3,000 square feet (278m²) in size with up to 3 full bathrooms, and its replaceable filter cartridge combines carbon block filtration with commercial grade water conditioning technology to deliver a full house, all in one solution. The NuvoH2O DPHB Home Salt-free Water Softener System is a compact, low maintenance point-of-entry cartridge-based water conditioner designed for use on treated municipal water supplies, but can be used on well water if a sediment filter is also used. The system is technically a water conditioner, as its uses a process of chelation to prevent hardness minerals in water from forming compounds that adhere to surfaces in the water system resulting in a hard lime-scale layer, rather than replacing calcium and magnesium hardness ions with sodium ions as occurs in a salt-based water softener. Its in-line design with a built-in valve in the cartridge-holder head, makes it easy to install and cartridges can be changed out with minimum of fuss and mess. The proprietary CitraCharge formulation in the cartridge contains an FDA-approved citric acid based solution that lowers the alkalinity level (pH) of the water, increasing its capacity to hold hardness ions in suspension. The NuvoH2O Home Salt-free System does not use ion-exchange technology and thus there is no need for either regeneration of resin media or the addition of salt, and it is not necessary to have a drain point nearby. It also does not contain any electrical or electronic components and so doesn’t need an electrical connection nearby. This system has been independently tested on water with a hardness level of approximately 15 grains per gallon (259ppm) and a pH level of 7.8 to 8.0, and is designed for a home of between 1,000 sq. ft. (93m²) and 2,000 sq. ft. (186m²) in size. The tests showed that the NuvoH2O system effectively prevented over 98% of scale formation compared with untreated water. Its ability to prevent scale formation also led to a 27% energy saving in water heating, when compared with untreated water. A summary of the study and results is available on the NuvoH2﻿﻿0 websit﻿﻿e. Overall, the NuvoH2O Home Salt-free System will noticeably reduce the formation of scale and improve the quality of water in small to medium size homes with water hardness that is not at excessive levels, and if used in conjunction with an appropriate water filter. NuvoH2O systems come with a limited lifetime warranty on non-consumable parts, fully transferable with the sale of the premises, as well as a 90-day from proof of purchase Money Back Guarantee, less shipping and handling costs. NuvoH2O Home Salt-free System will noticeably reduce the formation of scale and improve the quality of water in small to medium size homes with water hardness that is not at excessive levels, and if used in conjunction with an appropriate water filter. ​A water softener is a device that removes water hardening chemicals in the form of calcium and magnesium minerals from hard water and replaces them with the sodium component of salt in a process called ion-exchange. Sodium does not combine with other minerals in the way that calcium and magnesium do to form ‘lime-scale’, but remains in solution in the water. This prevents the build-up of scale in water pipes and fittings, and water heating appliances, and allows soaps, shampoos and detergents to foam more easily. “Salt-free water softeners” are devices that prevent the buildup of lime-scale without the use of the manganese or salt-based ion-exchange process, and are correctly termed water ‘conditioners’ or ‘de-scalers’ rather than water softeners. In most cases the water conditioner uses a process that ‘modifies’ the calcium and magnesium ions so that they do not combine with carbon dioxide in the water to form lime-scale. Any scale that does form will not adhere to surfaces and may actually remove existing scale over time. Where water containing the ‘conditioned’ ions evaporates, such as on kitchen or bathroom surfaces, the white layer that is left is more powdery than scale, and can easily be wiped away with a cloth. Most water conditioners use an active ingredient that is impregnated in a replaceable cartridge, which requires periodic replacement, but do not require any electrical power. Some water conditioners, termed ‘de-scalers’, use electromagnetic pulses to condition hard water so as to reduce and remove scale build-up, but their effectiveness and efficiency appears to be about half that of cartridge-type water conditioners, based on tests carried out by the Ira A Fulton School of Engineering at the Arizona State University. They have the advantage that there is no cartridge or salt that needs to be replaced or replenished, so they are considered maintenance-free. However they should not be used for very hard water sources. There is much controversy about whether these devices actually work at all, however, especially those that use permanent magnets rather than electric pulses. ​If you find that you have scale deposits building up on your shower head, faucet outlet, or in your kettle, you will need to install a water softener in the water supply to your home. 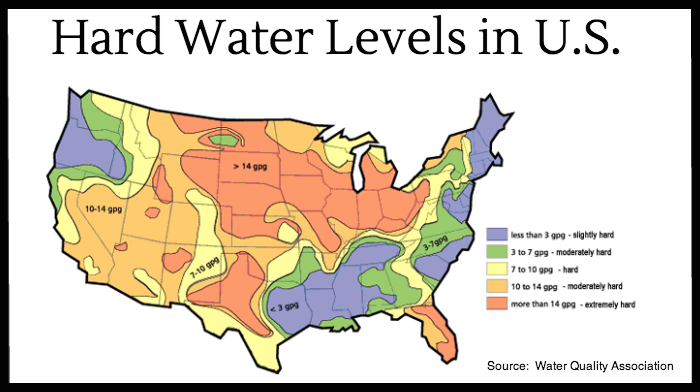 When buying a home, ask the agent or the neighbors about the water hardness in the area. If it is a new home, you could ask the neighbors, or if in a new neighborhood, go to the local water utility offices to find out about the water hardness. Should you be informed, or suspect, that the area suffers from ‘hard’ water (harness part, you should either purchase a home water test kit, or engage an expert to test the water quality. This is because it is important to know the water hardness, expressed in grains per gallon (gpg), milligrams per liter (mg/l) or parts per million (ppm), before deciding on which type and model of water softener you need to install. Water softeners should not be confused with water filters, as they are used for different functions. A water softener is used to replace or condition scale-producing minerals in ‘hard’ water in order to reduce the formation of lime-scale and improve detergent performance. The function of water filters is to remove particles, chemicals and dissolved organic compounds that may pose health risks or cause discoloration of the water. Water filters are available for a range of different uses, from basic sediment filters for removing silt and sand particles from a water supply, to carbon block filters for removing chlorine and similar chemicals from water, to reverse osmosis (RO) systems which remove almost everything from the water and produce almost sterile water as an end product. It is possible to purchase combined water softener and water filter systems, although these often in reality combine water filters with water conditioners, rather than true ion-exchange water softeners. It should also be noted that water softeners will remove a certain amount of soluble iron from water, but that this will reduce the effectiveness of the water softener. Each grain of iron hardness is equivalent to 3 to 4 grains of calcium or magnesium hardness. So iron removal should preferably be undertaken by a separate filter, unless one uses a specific combination water softener and iron filter such as the Iron Pro 2. In many cases, it may be wise to use a pre-filter ahead of a water softener or water conditioner system, in order to reduce the amount of solids entering the system and avoid problems of clogging and coating of active elements by sediment. A simple spin-down sediment filter is a cheap and easy to maintain solution, but for poor quality water, such as well water, it might be necessary to use a more effective filter. A number of different types of water softener are available for you to choose from, according to your particular need. Portable water softeners are aimed at the RV enthusiast, and to a lesser extent, at boat owners. These systems are smaller than standard water softeners and require regeneration to be undertaken manually by adding salt to the tank and reversing the flow of water through the softener. Portable water softeners often operate with ordinary table salt, rather than coarse or solar salt as required by standard household water softeners, so they cost only pennies per gallon to run. They resemble agricultural spray tanks and can quickly and easily be connected via a water hose to a water supply faucet at a trailer park or campsite, and just as quickly disconnected and stored away. Electric water softeners have automated electronic timers and valves for activating the backwash cycles on either a time or volume basis. More advanced digital controls will indicate how many gallons of hard water can still be softened before the next regeneration cycle. Non-electric systems generally refer to small-volume, manually regenerated, portable water softeners, or to water conditioners that use cartridges rather than ion-exchange technology (see “Salt Free Water Softeners”). Some single tank and most twin-tank ion-exchange water softener systems operate on non-electric timers and water pressure alone. The advantages of a non-electric system are that there is no need to have a power point close to where the system is to be installed, and that a power cut will not affect the operation of the system. A disadvantage is that the system is unable to provide information on its status because it is not equipped with a digital electronic read-out. Twin-tank water softener systems have been used in commercial applications for some time and are now becoming more popular in domestic households. The twin-tank system has only one brine tank that is shared between two ion-exchange tanks, hence the ‘twin-tank’ label. The twin-tank system allows the flow of softened water to continue even during the regeneration cycle by alternating between ion-exchange tanks. So when one ion-exchange tank requires regeneration, the other will be available to soften water, and vice versa. With a single-tank system, hard water will bypass the ion-exchange tank during the regeneration cycle. If a household never uses water during the early morning hours, it might be possible to set the regeneration time of a single-tank water softener system to those hours, so that no ‘hard’ water enters the system. Marketers of twin-tank systems argue that a single-tank system might run out of capacity earlier in the day, thus allowing hard water into the system before regeneration takes place, and that if water is used during the regeneration cycle, it will be hard water that bypasses the ion-exchange tank. Twin-tank water softener systems often rely on a mechanical timer and water pressure alone, with no electric supply needed, but with no electronic read-out available. Twin-tank systems obviously have a higher initial cost, and require more space to install. They were designed for commercial applications where water may be required at any time of day or night. Anyone looking to buy a water softener system needs to decide for themselves whether the extra cost of a twin-tank system is justified by the amount of hard water that may enter their household water system during a regeneration cycle, and whether they have the space required for such a system. Since salt-based ion-exchange water softeners introduce sodium into the water, these systems are not suitable for people who have been placed on a low-sodium diet for health reasons. In addition, since most wastewater treatment works are not designed to remove salts from water, some municipalities legislate against the installation of salt-based water softener systems. For these reasons, ‘salt-free’ water softeners are being increasingly promoted, and there are a growing number of ‘salt-free water softeners’ on the market today, using various methods such as chelation, nucleation-assisted crystallization (NAC/TAC), and electromagnetic pulses. Technically, salt-free water hardness treatment is considered ‘conditioning’ rather than ‘softening’, since the chemicals that cause water scale remain in the water, but their scale-forming potential is vastly reduced. Water conditioning may result in a form of ‘soft scale’ that does not bind as strongly to surfaces as ‘hard scale’ and can easily be removed, or will gradually loosen and be flushed out the system over time. The effectiveness of each method varies, and according to a comparison of methods including NAC/TAC and electromagnetic pulsing undertaken by the Arizona State University in 2010/2011, and an evaluation of the chelation method done by Battelle Institute in 2011/2012, chelation is the most effective process, followed by NAC/TAC technology and finally electromagnetic pulsing. However, it must be kept in mind that the tests on the chelation process and the TAC/NAC process were done by different laboratories using differing methods, and that both processes prevented over 88% of scale formation. Electromagnetic pulsing has been shown to reduce scale formation by approximately 53% and its effects to last for approximately 200 hours. There are differing opinions about the extent to which water conditioning reduces soap scum and allows soap and detergents to produce foam. Most user reviews appear to indicate that conditioned water does improve the production of soap suds and foaming when compared to untreated water. Clearly, then, when looking at ‘salt-free water softeners’, one needs to ensure that the unit is produced by a reputable manufacturer who has reliable proof of their system’s effectiveness and efficiency. In cases where there is a high degree of water hardness present, the effectiveness of salt-free water conditioners may be such that a salt-based ion-exchange system would be more effective. Buyers are confronted by a wide variety of brands and types of water softeners these days as more dealers enter the market. It is wisest to choose a well-known, reputable brand for your household water softening needs, as their technology will have been tried and tested. Fleck – Fleck is one of the best known names in water softener controllers, and their valves are used in a number of products. Iron Pro - another trusted name in water softeners, uses Fleck valves, as do a number of other water softener suppliers. On-the-go is one of the companies that specialises in portable ion-exchange water softeners for the RV market. Flow-Pur is another RV-focussed water softener supplier, using the well-known Watts valve for its products. World-renowned 3M Aqua-Pure is one of the leaders in the field of salt-free water conditioning systems. Nuvo H2O – this company was established in Utah in 2008 by LB Washburn after almost thirty years of commercial experience in water treatment and purification. First designed for the food services industries to protect steam cookers, the technology used in the NuvoH2O system been used by some of the largest businesses in the USA, such as MGM Resorts, Walgreens, Hardee’s and Carl’s Jr. The effectiveness of this company’s chelation technology is backed by an independent study by the Battelle Memorial Institute. Aquios – this Texas-based company has been producing water filtration products since 2009. Aquasana – this Texas-based company that specializes in domestic water filters and accessories was acquired in 2016 by international corporation A.O. Smith Corp., one of the world’s leading manufacturers of commercial and domestic water heaters and boilers. NAC/TAC technology has been scientifically shown to reduce scale formation by over 90%. Eddy Electronic – formed in 1999 by two English electronics engineers, this firm uses similar technology to that of AquaRex. The easiest system to install, as long as there is a power source nearby, is the electromagnetic de-scaler, which requires no plumbing interventions. Simply wind the two wires around the incoming cold water pipe as indicated in the instructions and attach the control box to the wall, plug in the system and away it goes! Salt-free water softeners, or water conditioners, that use replaceable cartridges are generally the next easiest units for installation. Simply close the water supply and cut a section out of the water supply pipe equal to the width between the inlet and outlet of the ‘head’ of the unit and connect it into the water line. Ion-exchange water softeners can be more challenging to install, often requiring a nearby power socket and drain point, as well as pipe elbows and extensions. Note also that not all the required fittings are necessarily shipped with the system, so you may need to purchase additional fittings. Water softeners are generally easy to use and require only basic routine maintenance such as regular salt addition and periodic cleaning, but every now and then a problem may occur, that needs special attention. Low water pressure: A drop in water pressure at your faucets is a sure sign that the cartridge of your salt-free water softener/conditioner is in need of replacement. Blockages: blockages can occur in the system and cause the water softener to stop working effectively. A blockage in the brine line between the brine tank and the resin tank is the most common cause and can be remedied by flushing this line with water. At the same time, the condition of the injector and screen should be checked. They should be cleaned or replaced if clogged. Also check the brine line for cracks and leaks and replace the tube if any are found. If you are uncertain about what to do, consult your user manual or contact a supplier for assistance. Salt-bridging: salt-bridging is a condition where a solid layer or crust of salt forms above the water line and prevents the salt from being drawn into the resin tank. This is usually caused by over-filling of the brine tank with salt. The solution is to clean all the salt out of the brine tank and refill only to the level specified in the user manual. Add some warm water and leave it to dissolve the salt for about 4 hours then initiate a backwash and regeneration cycle to get the system in balance again. You may need to repeat the cycles for two to three days before the system works efficiently again. Resin beads: If small plastic particles are noticed in the water supply, for example, in the water coming out of a faucet, it means that there is a problem in the resin tank. This can be caused by relatively high levels of chlorine in the water supply, which cause the plastic parts to deteriorate and break up, reducing the efficiency of the water softener. The resin beads in the resin tank should have a life span of ten to fifteen years, so if they start to break up within a shorter period, then there may be a problem with the system. Chlorine in the water can cause the manifold or filter at the bottom of the water softener tank to become brittle and crack, allowing resin beads to escape, or it can cause the beads themselves to break up and fit through the filter. If it is the former, the manifold can be replaced fairly easily, otherwise the resin beads themselves need to be replaced. 10% cross-link resin has a higher tolerance to chlorine than standard 8% cross-link resin, so it would be worth ensuring that your water softener is supplied with this resin if you live in an urban area where the water is chlorinated. For reliable performance, use salt pellets rather than rock salt in your brine tank, as the latter may contain contaminants. Also, have a professional check and undertake routine maintenance on your water softener system once a year for longer enjoyment of soft water in your home. Only refill the brine tank when the salt is almost used up. Be careful not to over-fill your brine tank; the maximum should be about two-thirds full of salt. Always use salt pellets or solar salt. Rock salt can contain impurities that will reduce the efficiency of your water softener and could cause blockages. Place a sediment filter in line before your water softener if you are drawing water from a well. You may also need an iron filter to improve the performance of your water softener in areas where ferrous (clear water) iron levels are high. When replacing the salt, poke the salt in the brine tank with a broom handle to check that no salt bridges are forming. Wash out the brine tank once a year by switching to the water feed to bypass and scooping all the salt and water out of the brine tank. Clean the brine tank thoroughly with warm water and soap; then rinse it out with clean water. Check that all the pipes are securely connected and clear. Switch the system back to normal use, and add salt to the brine tank – not more than ¾ full. Check for blockages in the injector when you replace the salt in your brine tank. The injector is located in the control head of the water softener. Read your user’s manual for instructions on how to remove it to check for blockages. Rinse the resin tank with ‘iron out’ or a similar product once a year to keep the resin beads in good condition. In addition, the hardness minerals will combine with chemicals found in soap and detergents to form a soap ‘scum’ which prevents foam and soap suds from forming and inhibits the cleaning effect of these items. Remember that it is essential to know the hardness of your water supply, as well as the levels of other minerals and chemicals, in order to determine the most appropriate water softener treatment system for your home. What is hard water vs soft water? 10.57gpg or more as ‘very hard’ water. above 180 as ‘very hard’ water. Scale, or lime-scale, is the hard white or cream-color layer that builds up in water pipes, on water fixtures such as shower heads and in water heaters and kettles in areas where the water supply is ‘hard’, or calcium-rich. It is formed when water containing high levels of calcium or magnesium is heated, thereby increasing the amount of carbon dioxide that is released, leading to the formation of layers of calcium carbonate crystals on heated surfaces. This scale builds up on heating elements, partially insulating them from the water they are supposed to be heating. More energy is thus required to heat the same amount of water, leading to inefficiencies and increased heating costs. Scale can build up in water pipes and water fittings such as faucets and shower heads, restricting water flow with the associated nuisance and cost of having clean water fittings and replace pipes. ​This is achieved by soaking the resin beads in a strong salt solution or ‘brine’ that is drawn from the brine tank of the system. The sodium from the salt in the solution displaces the calcium and magnesium ions that have been removed from the water during the previous water softening session, and the used solution if flushed down the drain. This process is repeated several times until all the resin beads have been ‘regenerated’ with sodium ions, and the resin bed is again ready to soften incoming hard water. Kinder to your skin and hair. The amount of sodium absorbed into softened water during the ion-exchange process will be roughly half that of the hardness of the water. Thus, water that has a hardness of 10 gpg will increase its sodium content by approximately 5 grains, or 5 x 17.1ppm = 85.5ppm of sodium per gallon of water consumed. The UK Drinking Water Inspectorate limit for sodium content in safe drinking water is 200ppm, so this is well below the recommended limit. In comparison, it is estimated that there is 4 to 5 times more salt in a glass of milk than in a glass of softened water. In areas of very hard water, however, softened water should not be used for the preparation of baby’s milk from formula. 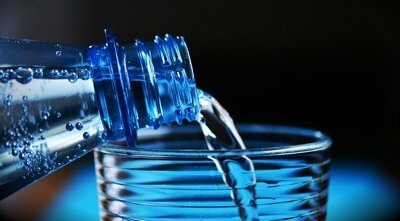 Find here more basic information about the quality of the drinking water in the US. How do I calculate the size of water softener I need? The basic calculation for the water softening requirement of a household is the hardness of the water in gpg multiplied by the average volume of water consumed per day in gallons. This will give the daily water softening requirement in grains. Since it is recommended that a water softener regenerates at least once per week, the daily requirement is then multiplied by seven to give the recommended capacity. So if your water hardness, as measured or provided by the local water authority, is 10gpg and your household uses on average 250 gallons of water per day, your water softener should have a capacity of around 2500 grains x 7 days = 17,500grains. What is a grain of water hardness? A grain is equivalent to 1/700th of a pound, and is equal to 17.118 parts per million (ppm) or milligrams per litre (mg/l). In the context of water hardness, it is a measurement of the presence of calcium and magnesium in the water supply, usually termed grains per gallon or gpg. Note that each 1ppm of iron present in the water is equivalent to 3 grains of water hardness. Average use is approximately 6 to 8 lbs of salt per 1 cu. ft. of resin per regeneration at an economical 24,000 grain softening capacity. 1 cubic foot of standard resin is rated to treat 32,000 grains of hardness, but will effectively soften 24,000 grains of water hardness per cycle. How often do I need to replace the salt in my water softener? You should check the level of salt in your water softener at least once per month, but more frequently while you are getting used to your new water softener. It is recommended that the level of salt should not be allowed to drop lower than 3” to 4” (7.5 to 10cm) above the water level in the brine tank. Can I use potassium chloride in my water softener instead of salt? Yes, potassium chloride is an acceptable substitute for salt in most salt-based ion-exchange water softeners. Although the use of potassium chloride will reduce the amount of sodium in the softened water, states that legislate against water softeners on the basis of salt contamination also view potassium chloride as a form of salt. In addition, potassium chloride is substantially more expensive than standard salt, so one must be sure to evaluate all options before deciding on the use of potassium chloride. If a member of your household is on a low sodium diet for health purposes, it is advisable to consult a medical practitioner about the use of either a sodium or potassium based water softener. What are the characteristics of different types of resin beads? Consult your local water softener dealer as to which type of resin you should use in your water softener. When do I need to replace the resin beads in my water softener? Resin beads generally last 15 years if the water softener is well maintained. In the presence of chlorinated water, standard beads will generally not last longer than ten years. If you see small fragments of resin beads appearing in your softened water, then your resin beads are breaking down and may need to be replaced. Open the ion-exchange tank and feel the beads for firmness. If they are mushy or broken then they need to be replaced. When do I need to use gravel in my water softener? A gravel bed will reduce the chances of ‘channeling’ in the resin bed, whereby hard water flows through openings between the resin beads without undergoing the ion-exchange softening process. Every water softener supplier will have a different opinion on whether a gravel bed is necessary, and most household systems are sold without gravel. Generally, gravel is used with larger capacity systems of 2cu.ft. (64,000 grains) or more. With such a wide variety of options available, choosing the right water softener for your home can be a bewildering experience. Remember that a reliable water testing kit or service provider is essential in determining the level of hardness in your water supply, on which you will need to base the size of system you require. A rule of thumb for water usage is 75 gallons (284 liters) per person per day. Always go for a larger capacity system than your calculation, to provide for times of extra water usage, such as when friends or family visit, and to allow for extra softening efficiency. If you want to avoid a salt-based water softener because of a low-sodium diet, you can either use potassium chloride salt in an ion-exchange system, or opt for a salt-free water conditioner. Both hard and soft water have health benefits, so whether you choose the latest, largest water softener available, or can only afford an entry-level water conditioner or de-scaler, you will still be a winner. De-scaling will save you costs in fuel and cleaning materials, water softening will give you the added benefit of a silkier feel to your household water. We trust that the information we have given you will help you to choose the one that best suits your circumstances. Whatever you choose, go ahead and enjoy your home’s new water.